Western Digital said at OCP Global Summit last week that over half of hard drives for data centers will use shingled magnetic recording (SMR) technology in 2023. 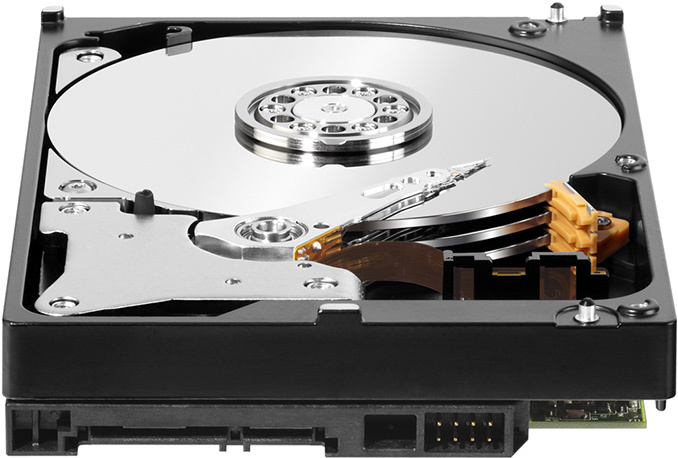 At present Western Digital is the only supplier of SMR HDDs managed by hosts, but the technology is gaining support by hardware, software, and applications. SMR technology to boost capacity of hard drives fairly easily but at the cost of some performance trade-offs due to the read-modify-write cycle introduced by shingled tracks. Since operators of datacenters are interested in maximizing their storage capacities, they are inclined to invest in software that can mitigate peculiarities of SMR. As a result, several years after Western Digital introduced its first host-managed SMR HDDs, more and more companies are adopting them. 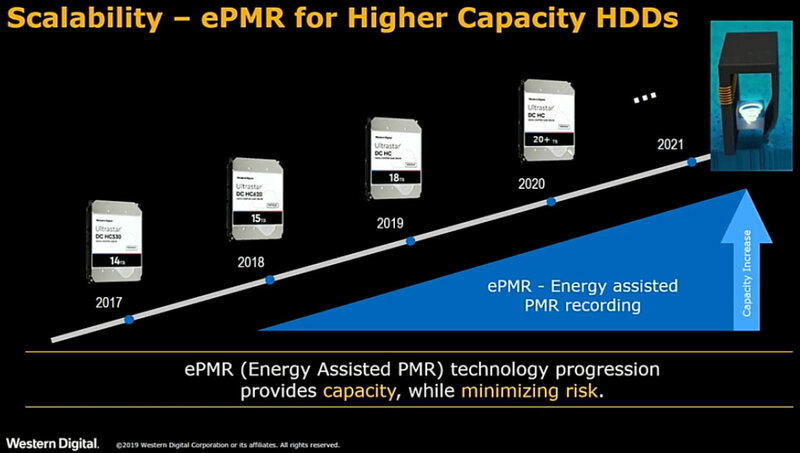 Right now, the vast majority of datacenter hard drives are based on perpendicular magnetic recording technology, but WD states that in four years SMR HDDs will leave PMR drives behind. Obviously, usage of SMR will not be the only method to increase capacities of hard drives. Energy-assisted PMR technologies (e.g., MAMR, HAMR, etc.) will also be used by Western Digital. In the coming quarters the company intends to release MAMR-based HDDs featuring a 16 TB (ePMR) and 18 TB (eSMR) capacity. The company also plans to introduce 20 TB HDDs in 2020. High-capacity hard drives are not going to be replaced by high-capacity SSDs any time soon, according to Western Digital. 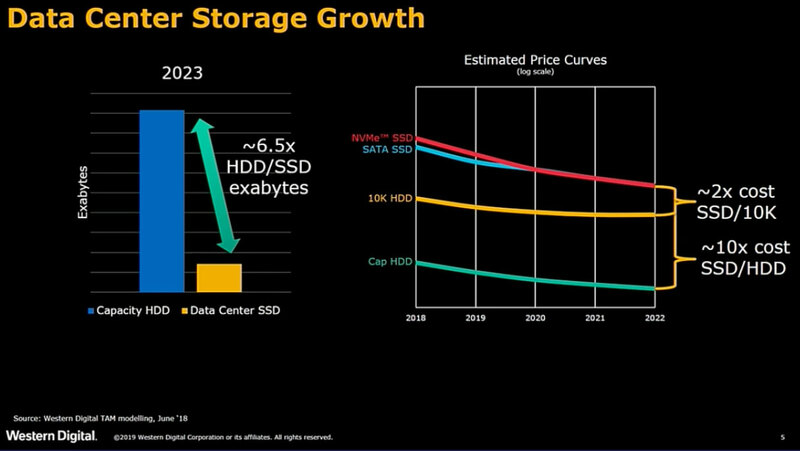 HDDs will continue to cost significantly less than SSDs on per-TB basis. Therefore, they will be used to store 6.5 times more data than datacenter SSDs in 2023. It's not whether you can fill a server with SSDs, it's whether it makes financial sense to do so. "Enterprise SSDs" are at a premium to "Enterprise HDDs". If you're storing a significant amount of data, especially for a free-to-use service, you're probably still using HDDs. Hahaha been in business 10 years now. I just checked my business folder and its around 10GB but thats due to pictures of projects and stuff. My invoice database is 700kb and my taxes (1099's, W2's, etc, PDF's and all) for the last 10 years only amount to 50MB.